In 2015, the Detroit Lions‘ defensive line was hapless. The team’s most-played interior defenders, Haloti Ngata and Caraun Reid, finished the year with dismal grades of 65.1 and 57.6, respectively. It was clear some rebuilding was in order — and rebuild they did. The following draft class featured A’Shawn Robinson, the talented big man from Alabama. Robinson would finish 2016 and 2017 as the Lions’ highest-graded interior defender, but his 63.1 (59th) and 66.7 (69th) marks still left something to be desired. This year, the Lions snagged another proven Alabama talent in the draft, Da’Shawn Hand, to round out their defensive line. Or so they thought. Damon Harrison, easily the league’s best run defender, was made available by the New York Giants after Week 7, and the Lions pounced. They gave up just a fifth-round pick for the same player who led the league in run-stop percentage each of the previous four years. But even before the acquisition of Harrison, the Lions’ two young linemen hit their stride. 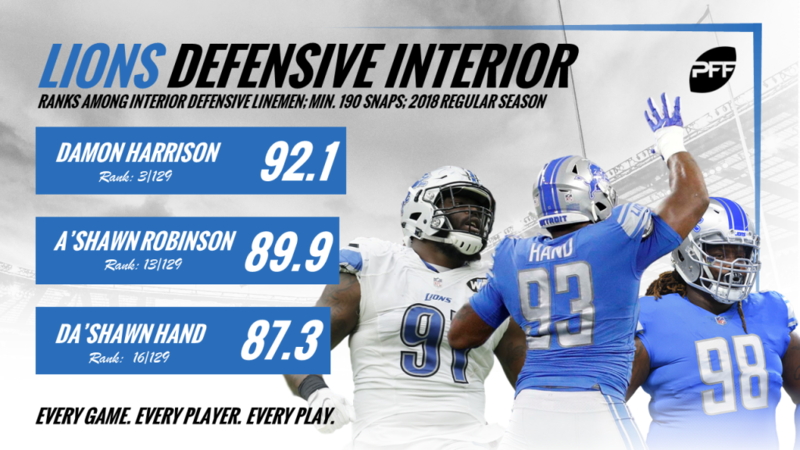 Through the first seven weeks, only two teams had two top-15 interior defenders — one of them being the Lions with Robinson (84.7 grade through Week 7) and Hand (89.6 grade through Week 7). In the same span, Hand notched a run-stop percentage of 10.8 percent (14th) while Robinson turned in a 14.3 percent run stop percentage — the same as then New York Giants interior defender Damon Harrison. One week later, and the indomitable run-stopper joined forces with the rising duo to form an elite trio. From there, opposing offenses, particularly opposing running games, had no chance. From Weeks 1-7, the Lions’ defense allowed the second-most yards after contact on runs (3.39) and the most yards per carry (5.32). From Weeks 8-17, however, they allowed the sixth-fewest yards after contact on runs (2.51) and the fourth-fewest yards per carry (3.73). The defense also allowed an impressive 1.22 yards (6th) before contact in the final 10 weeks of the season after allowing a 1.93 average (28th) in the first seven weeks. Since joining the Lions, Harrison again cemented himself as the league’s most dominant run defender — he made first contact from an interior defender position on 42 rushing attempts, eight more than the next highest defender in that time span. Robinson added 19 first contacts while Hand contributed six. By the regular season’s end, out of 134 qualifying interior defensive linemen, Harrison finished first in run-stop percentage (17.0 percent), Robinson finished 12th (11.2 percent) and Hand finished 39th (8.1 percent). Hand also proved to be the Lions’ biggest contributor in pass-rushing from the interior, as he racked up 25 quarterback pressures en route to a 24th-best 5.8 pass-rushing productivity rating. All three linemen finished with grades that placed them top-20 at their position in the regular season— all being higher than 85.0 — and in turn molded themselves into a force to be reckoned with. And while pass rushing certainly isn’t the improved line’s strong suit, this isn’t the same Lions’ interior from a few seasons ago — this is one that can carry the team far in 2019 if it plays at the same elite level.